I love having leftovers for lunch! This dish made a pleasant dinner with my parents and a tasteful lunch for me. Main: Vegetable Biryani – I did not use the cumin seeds, used ground ginger, and added lime juice after cooking. 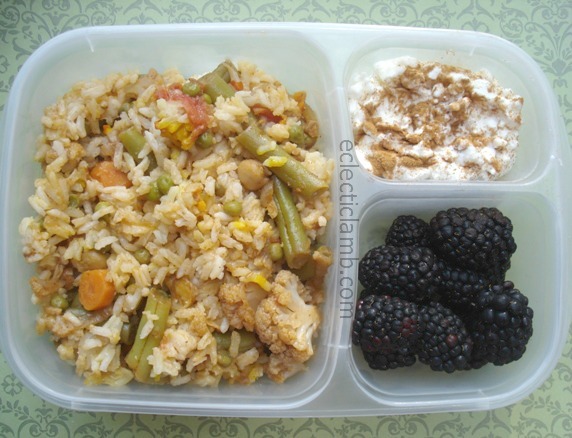 This entry was posted in Bento / Cute Food, Food and tagged bento, leftovers for lunch, vegetarian. Bookmark the permalink. This looks so delicious! We love biryani rice and such a great idea to add veggies in it, I have to give it a try!! I usually make ours plain to go with curry or sometimes add cashews and raisins. Thank you Rina! Curry sounds good. I should make some this week. I love biryani! This looks great!